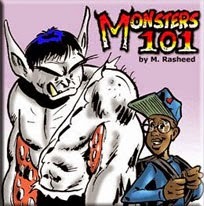 Monsters 101 is a high adventure graphic novel series by creator M. Rasheed. 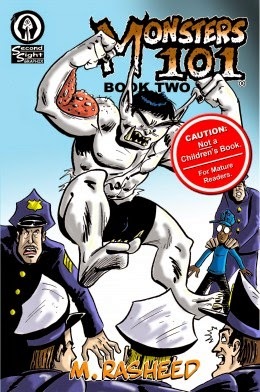 Starring the former school bully turned super-strong monster Pugroff, and his former favorite nerd victim Mort, the two protagonists interact in a world full of child-eating monsters and other supernatural beings. 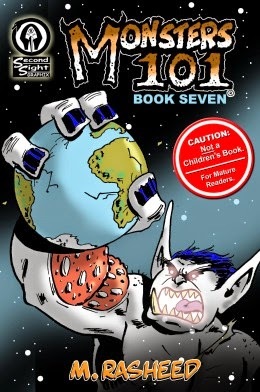 The "Monsters 101" in the graphic novel series title, references the fact that the new monster Pugroff has to now learn HOW to be a monster. Starting with Book Four, class is now officially in session. 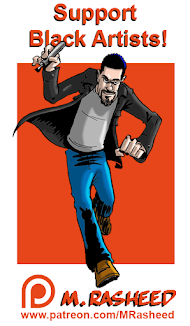 Trained at the facility of comics legend Joe Kubert, cartoonist M. Rasheed quickly developed a reputation for producing good work very quickly. Highly prolific, he developed the first 300 pages of his masterwork Monsters 101 shortly after leaving school. 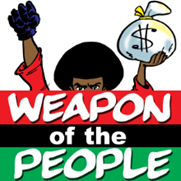 Joining the ranks of accomplished trailblazers Jeff Smith, Stan Sakai, and the ever-controversial Dave Sim, M. Rasheed has now also completed a long-form comic book story, and is currently the only African American cartoonist to do so. 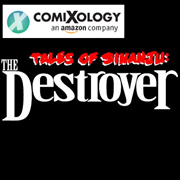 Featuring elements of classic horror, fantasy, and a touch of Lovecraft on an action adventure base, readers delight at the non-stop thrills per page they experience from reading Monsters 101. A tale of redemption and self-discovery, while tying together numerous aspects of popular genres competently well, readers express a genuine fondness for the journey, as well as for the author’s ability to have them care for the characters as if they really know them, an impressive feat for any writer. The One That Started It All! 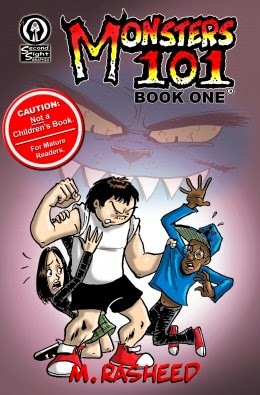 - Composed of six, 22 page chapters, this first, ultra-violent segment of the graphic novel series establishes school bully Willy Pugg as the baddest kid in Tanglewood Middle School. 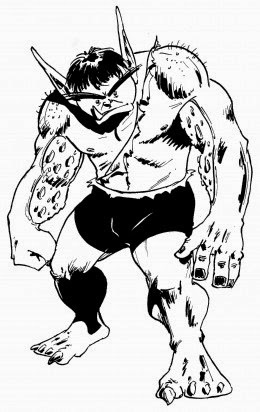 Stalking the halls like a psychopathic prison warden, the Pugg, as he is called by his victims, is pretty much unstoppable, until three, giant, foul-smelling monsters make his acquaintance. Agreeing to a horrifying deal with the creatures that dramatically changes the tone of the book, the adventure speeds along at a roller-coaster pace. Don’t let the cartoony art and friendly-sounding title fool you. In the tradition of It by Stephen King, or the television show South Park, even though it stars kids as the protagonists, it doesn’t mean it’s a kiddie read! Behold! Pugroff Is Here! - The three monsters from the first book of the series are from a race of creature who had become expert at hiding among humanity unseen for ages. 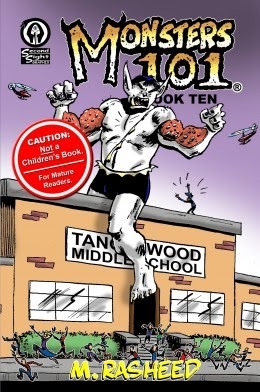 And now that the police are on the look out for whatever was responsible for the terrible Tanglewood Middle School massacre, the creatures certainly don’t have a problem slipping back into the shadows leaving the former school bully turned brand new monster Pugroff to take the blame! In the exciting second title in M. Rasheed’s graphic novel series, Pugroff is on the lamb not only from the local police department, but also from the Red Shield, the most powerful hero in the United Kingdom, come to find a missing foreign exchange student. 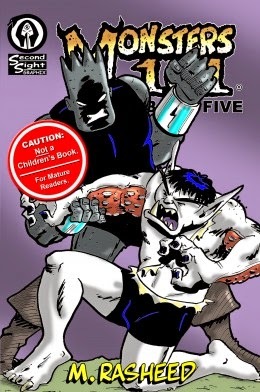 Mort decides to use his nerdy intellect to aid his former nemesis for reasons of his own, but in the end to keep Pugroff from facing the full might of the Great Red Shield of Legend, the two have to escape into the interdimensional devil world of Dharokalee... a perfect example of jumping from the frying pan and into the fire! From Nerd to Magician! - In this third segment of the 1,500 page tale, the adventures of Pugroff and Mort are in full swing! 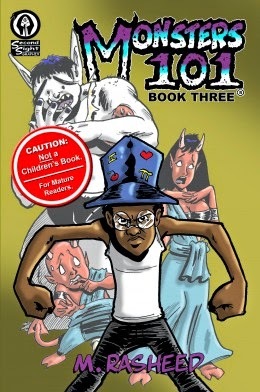 A keyed up Mort has taken several impressive steps towards realizing his dream of becoming a true magician, and in the devil world of Dharokalee there are plenty of thrills and dangers to test his resolve, much to his partner’s irritation. Rivals and enemies abound as the two adventurers find themselves in constant need of proving their worth to the snobby devil royal family, master magicians who are both jealous and impressed by Mort’s talents, as well as dismissive of Pugroff’s apparent low upbringing. 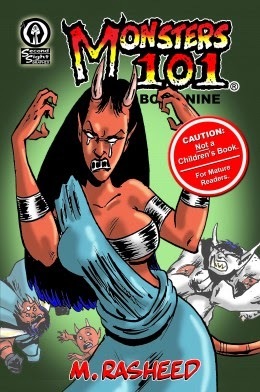 An ancient custom requires the king to grant Mort his fondest wish, but first, as the admiration of Kymbir, royal princess of the local devil tribe, blossoms into a full on crush of epic proportions, there is only one thing for Mort to do... have a battle to the death with her sorcerer fiance! An Education in Monstertude! - Pugroff and Mort finally return to earth from their two and a half books of interdimensional travel, but it’s not time for relaxing and Hero Bars™ just yet. Reunions with worried sick loved ones are due, particularly worried loved one who though the boys had died through some fallout from the Tanglewood Middle School massacre. While Mort’s grandmother takes steps to keep an eye on him that threaten to put a serious curb on any further adventuring, Pugroff’s dysfunctionally tragic household combined with his new monstrous appearance have him make a decision that is as sad as it is logical. Meanwhile the three monsters have successfully won the super-weapon that will enable them to enact sweet revenge upon the treacherous former bully who owes them his new found power! Wall to Wall Super Action! - A surprising reveal for Pugroff in this segment when he and Tanglewood Middle School’s Principal Smith discover each others’ secret identities. 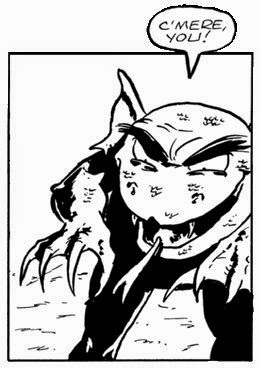 It turns out that Smith is retired former crime fighter Eye of Justice, who gives the monster some sound advice on some issues that have been plaguing him. Meanwhile Azoratain the trickster dragon is both surprised and delighted that the three monsters’ quest for the legendary faerie battle axe Dragon’s Fang was successful, and he comes to steal it for himself! Proving to be easier said than done when such a weapon is wielded by the ferocious Pugroff, the wily worm enlists the aid of the former bully’s oldest foe, Cliff the Hall Monitor, who is resurrected from the grave and given enough power to enable their momentous battle to continue where it left off… with Cliff beating the heck out of Pugroff! On the Event Horizon of Pure Evil! - Mort the boy sorcerer has gained his most notable magical skill to date, the ability to access the spirit world at will. The unseen entities on the Otherside are all too willing to instruct their eager pupil in the shamanistic arcane arts, but Mort’s studies must take a back seat when his second sight discovers a mysterious, thieving menace stalking the showrooms of a famous Oasis City museum, a place dear to his heart from childhood. Mort & Pugroff desperately attempt to rescue an ancient artifact the entities pilfer before they are able to unleash a literal hell on earth upon humanity. But all of this may be in vain as that very earth belches up a diabolical force that renders Dragon’s Fang itself useless, while Pugroff displays symptoms of a sickness that very well may result in an actual Armageddon of total destruction! Despair! for the End Is Nigh! - Way back in Book Two, the devil High Magician Pherlyren told Mort that in order to achieve his heart’s desire, he must find an earth magician mentor. The sorcerer pointed him in the direction of the Golden Order of the Encircled Serpent, whose members are the best of the best of all Shemesu Heru third eye practitioners. In this book Mort has finally found one… just in time for the end of the world! 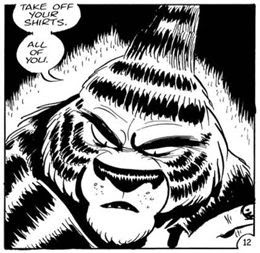 The mysterious circumstances as to how exactly Pugroff gained his power are revealed, and it turns out he is the avatar of an all-powerful demonic force determined to take over the universe. 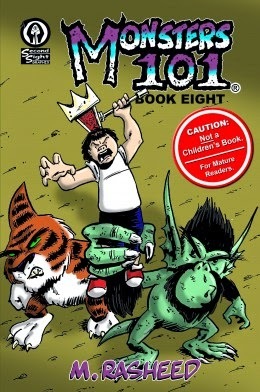 When the mighty Seventh Unicorn also shows up to help subdue the possessed Pugroff, Mort’s dimension hopping skills are put to good use as the three heroes have no other choice but to confront the horror on its own turf! It’s Not Easy Being the Monster King! - No longer the avatar of Irylor the First King, and stripped of his powers, the king of the monsters is now a mere human child. 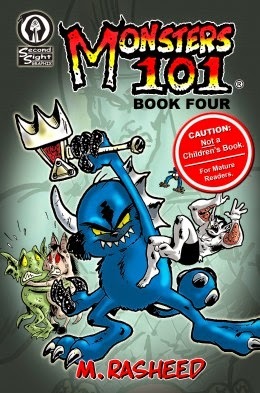 Although he insists on still being called “Pugroff,” and continues to wield the magic axe Dragon’s Fang, it is clear that both the little boy king and his loyal monster crew are way over their heads in attempting to defend the Nasheran throne from the immensely powerful tenth generation super monsters who are constantly challenging for it. Realizing that only a potent magic user can restore his former might, the king decides to make a deal with the devil and summons the dragon Azoratain and convinces him to return his power in exchange for his heart’s desire… Dragon’s Fang itself! 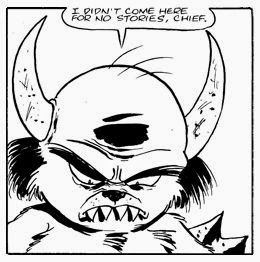 Meanwhile Mort’s quest to find a mentor continues, although his decision to enlist the aid of the strange unseen entities may not be the wisest of choices. Vengeance Is Shaped like a Devil! - Kymbir, devil princess of Dharokalee, did not take Mort’s rejection of her well. Her heart break-fueled temper, backed by the fact that she’s actually a far more powerful magician than her father Chief Karvek, has left the ten million year old tribal city Tcharen Koh in devastated ruins, and most of the population stuffed in the palace dungeons. Her brother prince Kyslo was able to escape into the spirit realm where a chance encounter with the object of his sister’s distress gives the mischievous little imp opportunity to beg Mort for help, as well as eat humble pie for being such a jerk during the boy magician’s previous visit. All well and good, but what can a guilt-ridden Mort possibly do to calm down a furious magician princess with the power to split the planet in half? The Only Way for School to End! - The real King Pugroff is back with all of his powers intact… and a little something extra. As a true Nasheran monster (with all that may imply!) the king has made a total commitment to his adopted people, and will not only vehemently defend the throne, but also Nasheran honor. Inviting all the monarchs, leaders, and sovereign representatives of the world to a banquet of sparkly goodies, he proclaims that he shall consider any disrespect toward the monster race an open act of war! 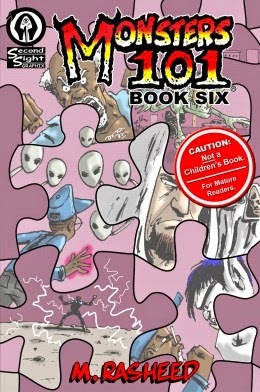 Meanwhile a crushed Mort, having been told he can no longer hang out at Castle Nashera, has a brutal confrontation with an angry Cliff, the stubborn African Architects, a Principal Smith who is once again ready to return to a life of high adventure, and an eerie group of the unseen who are savagely determined to make the boy magician follow their frighteningly alien way of life at the ultimate cost! Willy Pugg is the most successful bully Tanglewood Middle School ever had. 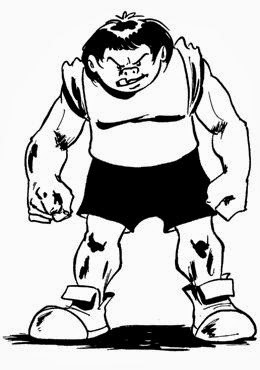 Over-sized for his age and unusually strong, "The Pugg" has been striking terror into kids smaller than him for years. Very sad and prone to low, low bouts of depression, a peek into the bully's home life revealed an abusive father and zero support. The offer to belong to a group that appreciates him for HIM is way too appealing, despite the fact that the group in question eats human kids for breakfast. When he was very young Mort's grandmother broke his heart when she told him that there was no such thing as "real magic." Instinctively recognizing that this wasn't true, he through himself into his math classes and structuring his mind around this universes integer-based language capable of decoding and manipulating our reality. As the partner of the new monster Pugroff, Mort was delighted to discover that magick was very real and his studies into mathematics had set him brilliantly ahead on the road to mastering the Wondrous Arts. The big, blue monster called Maescus (mis*kis) is the leader of the original trio that made the horrible deal with the school bully Willy Pugg. Maescus is very ambitious and is always working a plan designed to make him and his two cronies live in monster-style and comfort. A third generation monster (meaning he is a hybrid monster x3 with bear, bat and bull ancestry) Maescus is somewhat of a bully himself and doesn't mind running over people that he thinks is weaker than he is. He is loyal to his friends and is famous for always keeping his word no matter what the cost. The first and only monster magician, Benkom was the gopher/slave of a sorceror for many centuries. But because the monster race is notorious for being very, very, very bad at learning magick, Benkom only came away from the experience with a couple of spells in his head. Be that as it may, the second generation tiger/shark monster is one of the most powerful of his people and of course he had great ambitions... until his former partner Maescus stranded him on the alien world of Dharokalee and left him for dead. 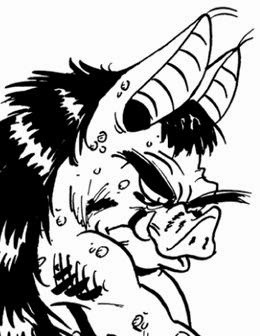 One of Maescus' flunkies, this first generation pig monster is strong, but lazy and argumentative. He's a sucker for a good plan, especially if it promises to get him more to eat. The old dangling carrot routine will get him every time... that plus a slap upside the head. Lodeth is a first generation lizard monster, and was recruited onto Maescus' team because of his phenomenal talent: He is the proud owner of the single most potent venom on earth. As impressive as that is, Lodeth is also valuable for his hard work and unflinching loyalty. On the con side, Lodeth isn't the sharpest knife in the drawer and will often find himself in tricky situations because he just "went with it." The ferocious-looking, shiney new monster called Pugroff isn't as bad as his bullying previous incarnation, despite the fact that he can tear a bus in half. Taking his new "hero" role seriously, his only real roadblock is the fact that he's not used to being a good guy and old habits die hard. He's had to work very hard to be a friend to Mort, but he's relieved to find that practice makes perfect... he only wants to punch a nerd MOST of the time as opposed to ALL of the time now-a-days. Kymbir is one of the most powerful magicians on Dharokalee, but because her tribe's culture is every bit as sexist as any in Earth's history it means very little. The menfolk give her a begrudging respect fearing her power, but she will never be included within any major decision making processes. Even her younger brother is held with more honor than she. As she is still young for one of her race, Kymbir rarely thinks about these things. The time may come however when her own ambitions may significantly outgrow her peoples' petty foolishness. Determine what I want to accomplish by the end of the 6 chapter, 22 page page book For example: "Transform a mean school yard bully into a heroic monster." One 22 page chapter at a time, determine what objectives in the tale are needed to logically reach the goal above. For example: Chapter 1, show a typical day in the life of the world's meanest bully. Chapter 2, the three monsters give the bully an offer he can't refuse, etc. One chapter at a time, block off specific numbers of pages and roughly describe the narrative of that chapter. For example: Pages 1-5 shows Willy Pugg terrorizing the students of Tanglewood Middle School. 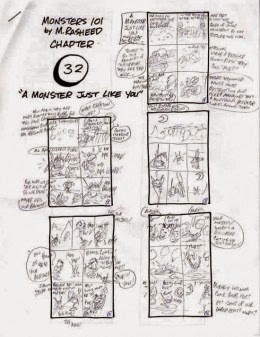 Create the Thumbnail Script, a mini version of the chapter on 8.5" x 11" paper in which the final dialog and page/panel layouts are made in their definitive form. This is the final writing stage. Rule the 10" x 15" image area on the finished artwork sheets of 11" x 17" paper, and also rule the panels using an HB mechanical pencil. Using the same pencil, lightly sketch in all artwork and lettering. 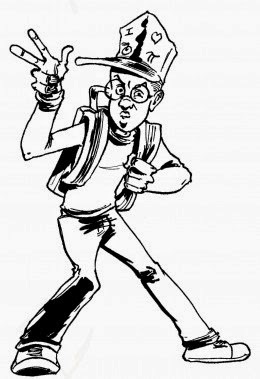 Use the Ames Lettering Guide to rule the appropriate lines in the word balloons that were lightly sketched in, and ink all lettering with a #103 crow quill, and B-6 Speedball dip pens. Use the #103 crow quill and watercolor brush to ink in all artwork. Do not fill in large areas of black with the brush. When the ink is dry, use a white vinyl eraser to remove all pencil marks. Scan pages into computer, and fix all inking mistakes in Adobe Photoshop. Create a numbered PDF file template at 6.14" x 9.21" and place cleaned up artwork into templates. Add publisher pages like Title Page and Copyright Page, etc. Create cover file and PUBLISH! M. Rasheed does not create children’s stories, but instead writes for his peer group. 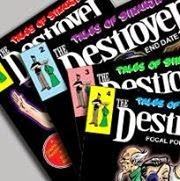 His tales take after the pre-Comics Code model, and blend both genre and demographic lines similar to the European comic book literary form. Often dealing with themes of graphic violence and adult humor, Monsters 101 should not be placed on shelves alongside general audience titles.